Former cricket pavilion in rural setting close to York City centre. Spacious 5 bedroom cottage sleeps up to 10, set on boundary of cricket pitch. Pavilion Cottage is excellent for all year rental, being close to York City centre.and all its attractions. The well-equipped five bed property comfortably sleeps ten. We have cyclist and child friendly awards from Visit Britain and supply five cycles for our guests to use. 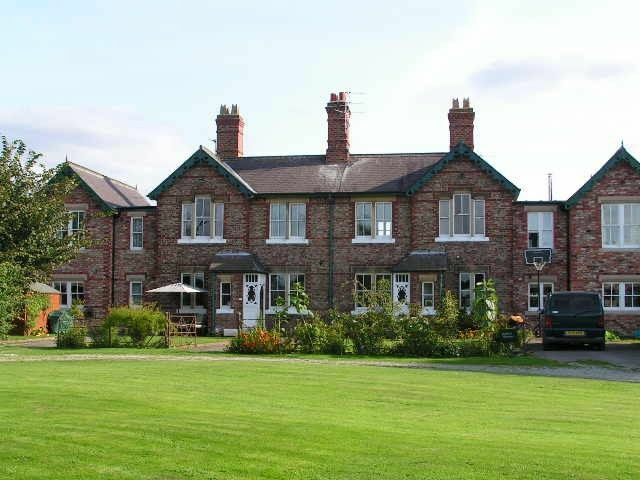 Despite being within a mile from York City centre the cottage is set in a rural location, making it ideal also for walkers and dog owners seeking a relaxing holiday. There is a gas barbeque and plenty of garden furniture. All bedlinen and towels are included within the rental cost as is all fuel used. The kitchen is well equipped with an electric fan-oven, dishwasher, fridge-freezer and microwave, a separate utility has a washer and we also have a tumble dryer. There are TVs, DVD players a Wii and a PlayStation 2 for guests to use. A separate children's room is equipped with games and toys. We provide a welcome tea tray on arrival, fresh flowers and a store cupboard of basic ingredients. Unrestricted parking for up to 3 cars. Golf: There are a number of local golf clubs and driving ranges within an easy drive of the cottage where guests can arrange to play. Horse riding: An easy car journey from the cottage finds you at a number of local businesses where horse riding for adults and children can be arranged. I live in the cottage next door to the holiday let with my husband, Ian, our three children and our boxer dog. I work part time from home as a secretary for my husband's business and originally set up the holiday let as a hobby to use up the spare rooms we didn't need. The business has quickly grown in success so keeps me quite busy now though I have a fabulous cleaner, Carole, who takes care of lets if I am away. We only have this one holiday let so you get the personal touch of an owner who takes care to ensure the property is prepared especially for you. Built in 1880 Pavilion Cottage was derelict when we bought it in 1993 with our first son, Tom, a new born, most of the windows were broken and boarded up and some doors were locked with no keys to be found so we couldn't even see what we were getting. We camped in a couple of rooms whilst gradually doing the house up. The property comprised two three bed cottages which had been built to house people working at Clifton Hospital and at the rear the pavilion for the hospital cricket team. We lived in one cottage and rented the other out to a series of tenants until our family grew too large, some particularly lovely tenants moved out and we converted the house into one. In 2004 we decided to extend the house but quickly realised we were creating more space than we needed so I decided a holiday let would be the ideal business to run in the vacant cottage. The cottage sits on the boundary of what (since the closure of Clifton Hospital) has become Clifton Alliance Cricket Club so is in the almost unique position of directly overlooking an active cricket pitch. As Clifton Hospital was a mental hospital with it's own farm and community the cottage is set in lovely grounds, surrounded by green fields, whilst being only a mile from the city centre, the rest of the site has been redeveloped to include a very nice pub - the Dormouse, part of the Vintage Inns chain, various offices, health care facilities and a residential estate but covenants on the fields mean they have been retained so that Pavilion Cottage still stands alone next to the cricket club. The king-size bedroom includes an en-suite with bath and separate electric shower. The separate family bathroom has a shower over the bath and the property includes a downstairs cloakroom. The ground floor of the property comprises a fully-equipped kitchen, separate utility room with toilet, children's room a snug sitting room with sofabed and small table and chairs, then a large dining/sitting room with two large sofas, the dining table etc. Peaceful, comfortable and in a lovely setting. Visiting York with three generations of family from 3yrs to 70. We all had a wonderful time, we did all the attractions but not always at the same time. The highlight however was Pavilion Cottage which is in such a great location. Close enough to York to walk into the center or to the Park and Ride which was a great adventure for our Grandsons who loved riding on the bendy buses. Thank you to Heidi for all the lovely treats, we will have great memories of our stay. I’m happy you enjoyed your stay at Pavilion Cottage, the best guests for my last let. I hope this is the beginning of lots of wonderful family holidays together for you. Heidi made our stay for our family celebration at Pavilion Cottage really special - the house was perfect for our mixed-age group with something for everyone. The fresh flowers and lovely welcoming pack of food was much appreciated - the lemon drizzle cake went down especially well. The location was perfect for us, far enough out of the busy city centre but only 20 mins walk to the attractions. We were also lucky enough to enjoy a cricket match right outside the door! The cycles are a great idea too. Thanks Heidi, hope we'll be back again soon. Thanks for your lovely review Sandra, I’m so pleased you enjoyed your stay at Pavilion Cottage especially considering the fairly awful weather you experienced, I’m glad it didn’t spoil your visit to York. The house was beautiful and comfortable for our group of 8. The owners were wonderful and provided bread, cake, tea, and coffee for breakfast as well as information on sites to see. We would definitely stay there again! Stayed 26th, 27th, and 28th May. Had a fantastic 3 days. Accomadation ticked every box! Lemon drizzle cake was lovely. Beers left in the fridge and flowers in every bedroom was a lovely touch. Went to York races on the Saturday and everyone had a winner. Barbecue on the Sunday afternoon as the sun came round to the patio area. There was a local music festival just to the left of the cricket pavilion with Iive bands playing in to the early evening. Couldn't fault the cottage in any way. Thanks for your lovely review, sounds like you made the most of your stay at Pavilion Cottage. I'm so glad the races were a success for you all and that you also enjoyed the music festival and using the BBQ. I think you were lucky to have good weather too. I wanted to thank you as well, Carole (the cleaner) particularly commented on how clean and tidy you had left the cottage, that's much appreciated. Pavilion Cottage is within a mile from York City Centre with all the attractions of York - York Minster, the Shambles, the National Railway Museum, boating on the River Ouse, York Dungeon and the Jorvik museum all easily accessible. For enthusiastic archaeologists York Dig is a must. The museum of Quilts is York's latest visitor attraction. The city centre is close enough to walk to or there is a regular bus and park and ride service. Within a mile out of town is a Vue cinema, Tenpin bowling, Laserquest, Creepy Crawlies Indoor playarea, Tesco and shopping centre. Monks Cross shopping centre is a car ride away and a popular shopping destination. We are close to Harrogate, the Yorkshire Dales, Whitby and Scarborough seaside resorts and easily accessible to the stately homes of Beningbrough Hall and Castle Howard amongst others. Other Activities: Tenpin bowling, laserquest & go-karting. Rental includes bed linen, towels and all fuel used, and includes a welcome tea tray on arrival. We have five bicycles available for guests to use, please contact us prior to your stay so we can service the bikes ready for your use.